In 2010 we developed an area of our field into a special story garden in memory of Jayne Laud, who worked here for over 20 years and was loved by everyone, colleagues and children alike. Kind donations from Jayne's friends, family and past pupils allowed us to create an area she would have loved. She loved to read stories so it seemed very appropriate. 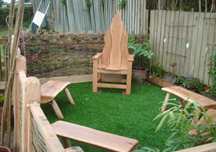 A local man made us a very special story chair out of oak, shown in the photo above. A green woodworker created several benches and some woven fencing for the area, in the photo to the right. 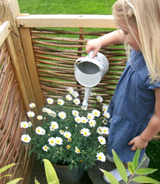 We planted a variety of flowers, trees and bushes, which the children help care for. Children enjoy hearing stories in this special area and some of the older ones even like to sit in the chair and tell their own stories to their friends!